SES's Change Management Control is a comprehensive Change Management system with a complete Help Desk system built in. Useful for Workflow Management as well as Business Process Management, the system allows users to create their own workflows, fields and business rules. Conforms to ITIL and ITSM standards. From the moment you log in to SES's Change Management Control software the Dashboard gives you a complete overview of everything that is active in your environment. From all active Change Management issues in the system, to Help Desk issues that require immediate attention, all users can see what they need to work on. Filter by category, status and impact and click on the changes you want to work on immediately. The Bulletin Board feature lets you post notices for either Staff, Users or both to see. LOOK UP CHANGES - Click image for more detail. The results of a change management search show just how powerful and feature-rich SES’s Change Management Control Software is. Search by any field in the system, keyword or combination of fields and from the results see quickly what you are working on, what needs to worked on, changes that are currently being edited and changes with attachments. Sort by any header from the results matrix, click on a change to get to work or export your result to Excel. The workflow designer allows you to create an unlimited number of workflows. That means you create the different states or steps that you need for your workflow. Through simple drag and drop configuration, you decide the flows from one step to the next. Workflows can be simple (linear) or complex (multi-directional). It's up to you where you use them (which application and which form). Choose both the form you wish to use (your custom fields and panels) and the workflow (your custom states and transitions). Upon opening your change, you will be presented with a drop down menu of your workflow. Choose a workflow and see the states you’ve created along with your staff logins to assign to each state. Decide the approval method for every state: Everyone, Anyone or More Than Half. ASSIGNING A NEW CHANGE - Click image for more detail. PROGRESS OR HOLD CHANGE - Click image for more detail. COMMENT LOG - Click image for more detail. HISTORY LOG - Click image for more detail. As a change progresses through the states of its workflow, every comment and status change is logged, date and time stamped in an easy to read comment log. This comment log is also viewable as a report in the “History Report” providing management with complete accountability of who, what, where, when and why. This History Log gives a full view accounting of any update or change that has happened to any field in the RFC. Often, there are numerous little (and big) things that need to be done to complete the change management process, but those things do not fall within the scope of the change’s main workflow. Create tasks and assign them out to make sure those things get done. The SES Change Management Control task feature can contain your own fields, notifications can be sent out based on those fields and actual progression from one state to the next in a change management request can be tied to the completion of tasks. CREATING A TASK - Click here for more detail. LISTS OF TASKS WITH CHANGE - Click for more detail. FIRST RESPONSE REPORT - Click here for more detail. TIME SPENT REPORT - Click here for more detail. CATEGORY CHART - Click here for more detail. STAFF WORKLOAD REPORT - Click here for more detail. AFFECTED SYSTEM - Click here for more detail. IMPACT CHART - Click here for more detail. Moreover, all data in the system can be exported into an Excel format for use in other reporting applications. Automatic email rules let you decide who is notified about an issues and when. Maybe the department head needs to only know when a new issues is open and then at quality control, but the Project Manager needs to be alerted every step of the way. Set up rules such as this with a few clicks of the mouse. Once an email notification is received, based on the recipients permission level, they can access that record right from a link in their email and work on it from there. CREATE A RULE - Click image for more detail. CALENDAR - Click for more detail. FAQ, KNOWLEDGEBASE, BULLETIN BOARD- Click for more detail. Not only is your Change Management Software a tool to manage change, it could and should be a repository of information to be shared among those in your organization. Change Management Control from SLAM Energy Software contains both an FAQ module and a Knowledgebase to let you leverage the experience and data from past work into reference tools for others to search across. The Bulletin Board feature allows you to post messages, based on priority, for users and staff to see on their dashboard upon login. Messages can expire after a threshold date, defined by you. 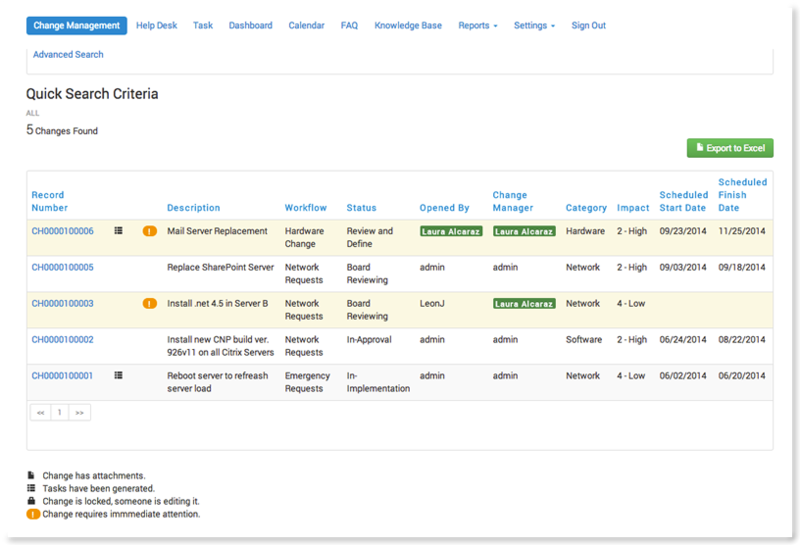 The menu of the Administrative Settings page shows the true power and functionality of what SES’s Change Management Control can do right from the web. The system can be completely customized, by you, to have the look, feel and data of your organization. Of course, we are here to help and have no problem getting our customers set up just right. Administrative Settings are limited to those who are system administrators of the software. SLAM Energy Software’s Change Management Software is a fully web based system that supports either Oracle or SQL Server as a backend. If you have an existing system that uses one of those platforms, we can import your data from that system and have you up and running in no time. The software also supports Active Directory to create User profiles so that those people in your organization do not have to remember another set of passwords. CHANGE MANAGEMENT LOGIN PAGE - Click for more detail. Sometimes a thorough change process is just too much, however issues arise that need to be tracked and possibly impact larger changes. SES includes a full help desk issue tracking system to accommodate this need. Let end user's submit tickets through the web or have staff submit. Use automatic assignment rules and notifications to ensure work gets done. 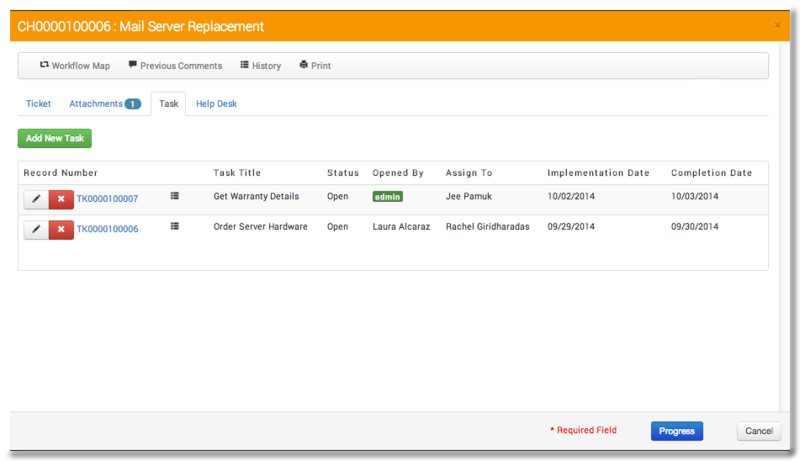 See more features of the included Help Desk tool here.